Reefton Integrated Family Health Centre is the home of all West Coast DHB services for Reefton. If you live in Reefton or are staying for a while, we encourage you to enrol with the practice. A full list of fees is available for all West Coast DHB GP clinics including Reefton IFHC. We welcome your feedback about our services and your experiences at Reefton IFHC. Booking and appointment with us is easy! You can make appointments to a doctor Monday to Friday 08.30 – 17.00 hours by calling us on 03 732 8605. If you are unable to get a doctor’s appointment we have nurse appointments available every day. You can also attend out walk-in clinics during working hours. To find out when these are held, call us on 03 732 8605. Parking is free and plentiful all around the building. If you don’t have a car or other transport and it is too far to walk to Reefton Integrated Family Health Centre, our District Nurses may be able to visit you at home. Community organisation Reefton Who Cares can also help people get to health appointments. If you are a patient you can be taken by car to be dropped off at the hospital main entrance, there is a car DROP-OFF ZONE for patients just outside Reefton IFHC. Please note: The Google Map has not been used in this section due to it currently being inaccurate and out of date. The Reefton Integrated Family Health Centre isn’t a hospital. For accessing urgent ED services please call 111. Grey Base Hospital in Greymouth is the only hospital facility on the West Coast that provides ED services. 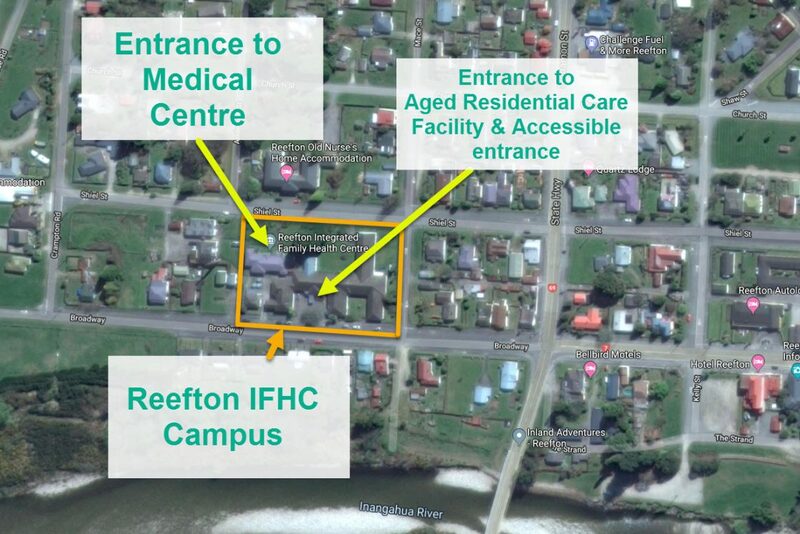 Urgent & acute health care services are available at Reefton IFHC. The closest emergency department is situated at Grey Base Hospital in Greymouth. The Reefton IFHC team works closely with colleagues in Greymouth to provide seamless care. For further details please phone Reefton IFHC reception 03 732 8605.